Home Sponsored Content Parenting. It doesn’t need to be difficult. Parenting. It doesn’t need to be difficult. “It’s hard raising kids these days” is an expression I’m sure you have said or heard. And it’s true. Raising good ehrliche children in today’s world is harder than it has even been. Until now. 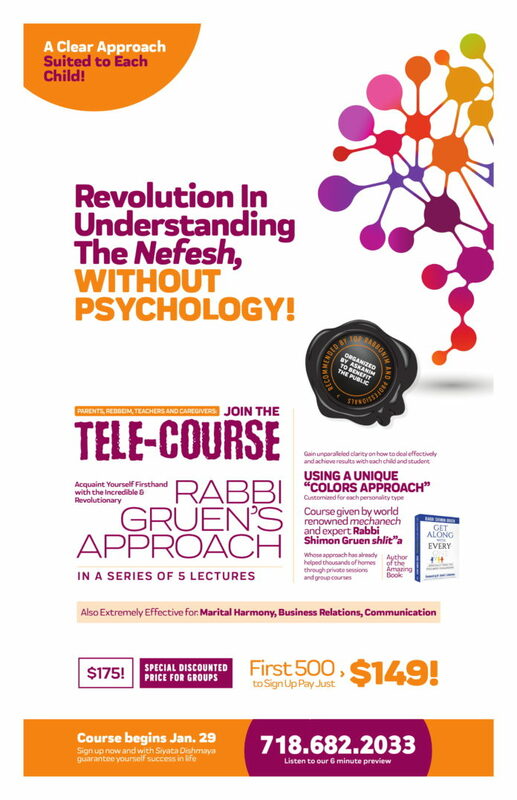 “Rabbi Gruen’s Approach”, a masterclass in chinuch and parenting given by master mechanech and educator Rabbi Shimon Gruen has already helped over 3,400 parents transform their lives. The fact is that there is no cookie-cutter approach to parenting. There is no “golden rulebook” that applies equally to all children; each child is different and needs to be parented accordingly. Rather, what needs to be learnt is the methods and techniques how to determine what the course of action and direction must be taken with each child. Each child is different. Each child is a world. Enter Rabbi Shimon Gruen. Rabbi Gruen, author of the best-seller “Get Along With Everyone” has taken his celebrated approach to parenting and condensed a lifetime of teaching into a concise, yet effective TELE-COURSE. You will learn his unique “Colors Approach” on how to custom tailor your chinuch for each particular child. Your child is great, you simply need the tools to bring out the best in them. You don’t have to be a professional social worker to be an amazing parent. With Rabbi Gruen’s Approach, you can learn how to successfully and relatively easily raise every child to blossom, even the ones you currently find “challenging”. Thousands of parents already have learned the tools and have changed their relationship with their children to one of bonding, closeness and understanding; you can be next. Your child is amazing, now you will learn how to maximize their potential as well.